Mix salt and pepper in corn flour. Now coat the paneer with that mixture. 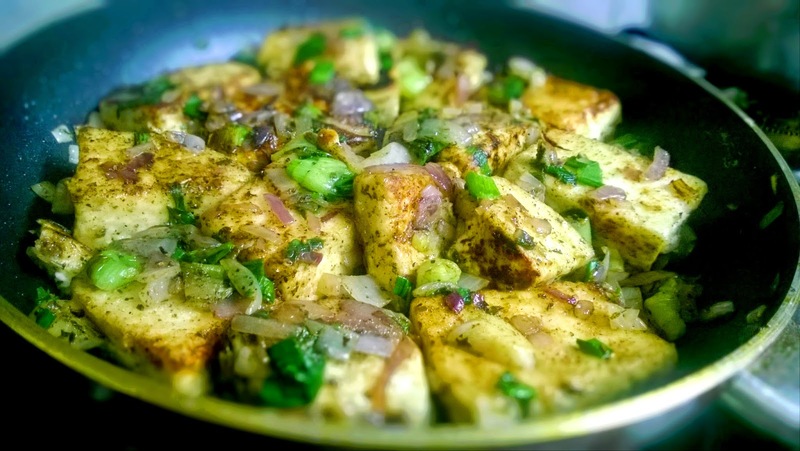 Heat oil in the pan and cook paneer cubes till they get golden brown color. Take out and keep them aside. Now use the same pan and add some more oil and heat it up. Add chopped onions and quickly add salt and pepper and cook for not more than 2-3 minutes. Remember, we don't wanna thoroughly cook the onions but only till they are translucent. Now, add paneer and mix. Now add chopped spring onions. We are adding them at the end as we want them so stay crisp and have a bite in the dish. Mix it well and serve hot!!! Now tell me, if it you could have it easier!! No na? So, leave your comments below telling me how you liked it and any feedback about my blog. Or anything you want me to post.